When you’re selling online, your product information is the equivalent to an instore, face-to-face sales pitch to your customer. It’s really important to get your description looking great and reading well so that it does the selling for you and provides your visitors with everything they need to know. Pitching your products well will turn your browsers into buyers. Product descriptions are the key text on your product page which the search engines will be crawling, so it’s important to consider your search keywords and how these will help with your search engine optimisation. 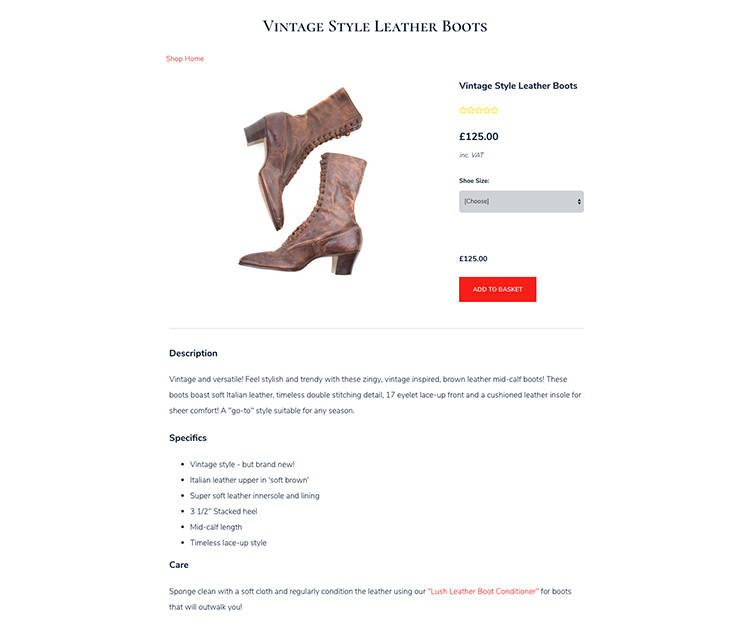 Writing your product information isn't just about listing specifications, it's your opportunity to persuade customers to buy your goods, and you should utilise it fully. Ensure you layout the product’s specifications for the speedy buyer so they can quickly scan the information alongside your prose. It’s obviously important to include details of what the product is actually about. What does it do? What size is it? How much does it weigh? What is it made of? The customer cannot look or touch your product so try to think about what you would want to know as a prospective buyer. When writing anything, you will want to think about your audience so you can best connect with them and speak to them on their level. What age group are your buyers? What type of people are they? You will want to tailor your copy to target them specifically. You may also want to reflect the tone or style of your business in your descriptions. Different products may have different audiences so make sure you're clear about each as you work through. It’s important to be precise and accurate about the details of the product. It will annoy and alienate your customers if you guess a measurement or assume a weight. Buying online is all about trusting that what the merchant says about their product is true, and if you get it wrong you may lose repeat custom, or have to deal with complaints and returns. Below is an example of how you might apply the point's above in order to make it much more likely to help achieve a sale. Let’s take a look at what was improved from the first product description. 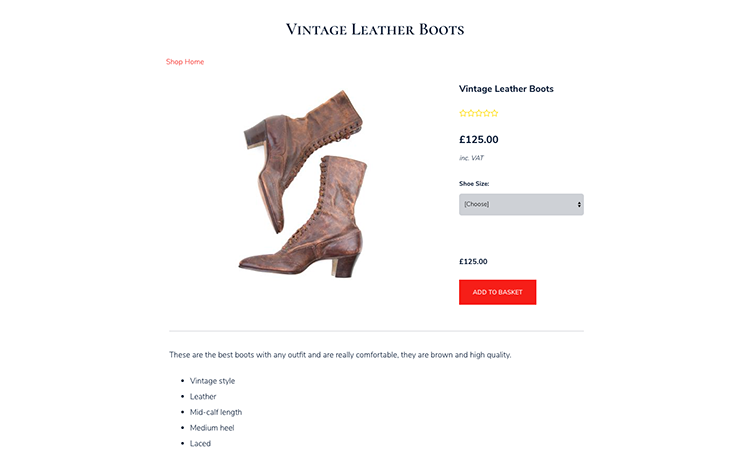 Firstly 'accuracy': the title of the product was 'Vintage Leather Boot'. This implied a genuine vintage product, when it is in fact ‘vintage style’. The listed specification in the good description is also in much more detail, but with some soft visual adjectives such “super soft” and “timeless”. Strong describing words help your buyer to visualise and picture themselves with your product, and it makes the product sound more appealing to them. The top description is very short and lacks personality, so we added some more information for ‘About’ and also made it more enticing with some descriptive adjectives. The improved description avoids vague superlative descriptions such as 'high quality' as these can come across as untrustworthy (unless a claim like this is backed up with evidence, of course). Finally, we have considered the 'audience' and used words that may appeal to the target market such as “trendy” and “zingy”. As an additional tip, you will see we added some “care” information. This is not only beneficial as it shows the customer what's involved in caring for the item, but it is also a great little opportunity for an ‘add-on’ sale. So there we have the three A’s in practice! Remembering these is a great way to ensure you have covered all the bases when you are writing about your products. Here are a few further tips to help you fine tune your text to turn views into sales. These are usually geared towards retailers rather than buyers so they may include technical jargon. What’s more, if you have product descriptions that are the same as others that exist online elsewhere already, it will be classed as duplicate content and will not look good to search engines. Unique content is king when it comes to SEO. Just as anywhere else on your website you'll want the content to be customer-friendly and search engine friendly. Consider if you will want to include one or two keywords, but remember your customer is your first priority here so make sure it’s primarily great for them to read. You can find out a bit more about writing keywords on your website here. It can help to link all of your products together and provide you with a routine for writing out your descriptions which can help keep your inspiration flowing when you’re doing them all in bulk. As a guideline rule, try to keep your product information under 350 characters (unless the product has a lots of features that all need to be described in order to make a sale). Too much text can be daunting and might put off the online browser, so keeping it succinct will help. Don’t just write your descriptions and never look at them again. Make time in your routine to go through and decide how you could tweak and improve them. Perhaps you could ask Facebook followers, or friends and family for some valuable feedback! We hope this advice has your creative writing juices flowing and you're now raring to write about your products. 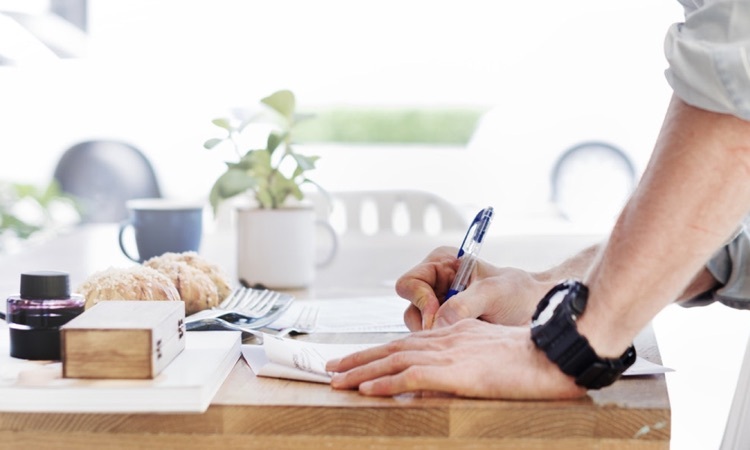 If you have any fantastic writing tips about creating successful product information, please share them below!